A postcard image of the Clinton Jaycees Gondola. Shortly after the first Little Italy Festival in Clinton, Indiana, the Clinton Jaycees set out to acquire a gondola for the town and her festival. Jaycees are a sort of "junior chamber of commerce", dedicated to helping and improving a community, and populated by young people. After some research, the Clinton Jaycees decided to have one built in Venice. In November of 1966, the order was placed. 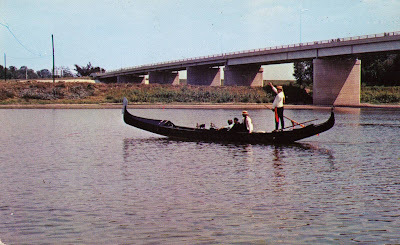 The gondola was delivered in time to be part of the 1967 Festival. For the first twelve years, festival-goers could take a gondola ride on the Wabash River. After that, the gondola remained on her trailer and has been a part of the parade that kicks off the festival each year. That festival is going on even as I write this - always taking place over the Labor Day weekend. 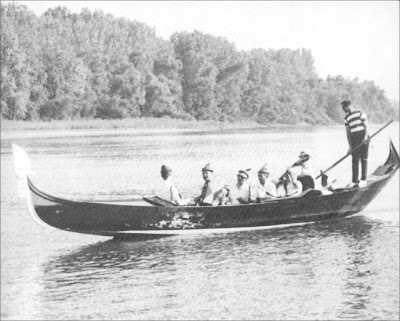 The Jaycees gondola afloat on the Wabash River shortly after her arrival in Clinton. I spoke with a member of the board there in 1999 and again in 2001. So far I've had no luck discovering the name of the squero where the gondola was built. I guess the next time I'm in the area, I'll just have to stop by and take a close look. If I do, I promise to post photos. The Clinton Jaycees Gondola today. If any of you get to Clinton before I do, please let me know...and please take pictures.